The live version of openSUSE 10.3 is now available as a GNOME or KDE CD. Both contain the same software as the 1 CD installation versions would provide you with, but as a live version. If you click on the Install icon you will be guided through the installation of openSUSE 10.3 onto your hard drive. The Live CDs version will be incorporated into software.openSUSE.org over the next few days. yeaah! but why not dvd? Because you can install the rest of the system or programs during the installation process or in YaST from within your desktop. The Live-CD installer doesn’t allow you to install more applications during installation though. Terrific! Any plans to release 64-bit version? Where is the MD5SUMS ? i like the install option. Like Ubuntu but better. easy to use easy to deploy, easy to install. disk partitioning needs some work however.. I tend to find openSUSE far easier to install and use. Not only that, but you know you have a real system that will work, instead of a system that will just work. Personally from my view the partition is great, you have a number of options available for novice and experts. Ya.. i isntalled it on my R61i, the partitioning was a bit confusing, but nonetheless fine. Could have been better. Otherwise the Gnome is working fine.. Most function keys are working. Have to check wireless lan, modem etc.. display adapters are fine.. Fingerprint option is seen, but not tested… wil update in a few days..
Are proprietary Wifi drivers or ndiswrapper/madwifi available for Internet on this disk? Will it allow wifi connectivity? If not I doubt I’d be using this ‘Live’CD, especially if it doesn’t allow connectivity or recognize wifi. I doubt it, if it’s the same as the installation CD. However there is already an extra CD with non-OSS software that you can add as a repo at installation time. I agree with you: Any live or installed linux cd without wifi autodetection is not useful, nowdays. A complete set of my favorite distro :-).I wait for this release because this is the best option to promote OpenSUSE. I have several question about OpenSUSE from user who interested with it, but they’re worried if new installation get their existing system broken. Agree, I’m getting more people to use openSUSE, the problem is they are windows users who are worried about not liking linux, so this live cd is perfect for them to try and get the hang of and see what a real operating system works like, instead of a virus, trojan infected windows machine, lol. Thanks for the live cd release, and thanks to all those who made it possible, now the next thing I am looking forward to, KDE4, and then openSUSE 11, hehehehe. Can I install live-CD into USBFlash drive? Any way to have a ‘frugal install’ of openSUSE 10.3 KDE Live. What would be the grub entry? Yes, I believe that this can be done using MySlax Creator. I used this program to install Backtrack2 to a 2Gb flash. Good Luck. Sorry, the reply above was intended for the the question asked by Alex three entries prior to this one. As a side-note: I was especially astounded that downloading and installing the Flash-plugin worked from within Firefox! – When I skip network-detection, registration & online-update I can install onto a VM in half an hour. I think these three are unnecessary during install. Auto-register the online-update source in the background AFTER install. Ubuntu does that better. – Unify installer welcome-screen with end-user-license agreement. That way no user-interaction after the first two screens would be necessary. I disagree. On-line update during install is the best for the distro. These CDs will still be in use when the script kiddies have many tools available to zap the system very quick. The older the release becomes, then more patches are required, and then the system is more vulnerable during a lengthy on-line update. Don’t want to give the distro a bad name with vulnerabilities, so you need to protect your folks who neglect patching or put it off for awhile. On-line update should always be part of the install. Is there any faster link? I’m getting the KDE version at 25kb/sec speed. USB flashdrive carried in my pocket would be useful to spread the word. Hi, in the live-cd (gnome or kde) when i try to change something in the system (color depth from 16 to 24 bit) i must restart X, then i must enter a Username and Password, but … i don’t know them !!! there is a boot option to start live-cd with resolution 1440×900 at 24 bit ? The user is called ‘linux’ and has as root no password. Can someone please explain how to log in to the live CD (or rescue system)? Thanks! and wireless management is too bad to say anything about…. Does the gnome live installer cd still require to install qt3 for anything or it is a pure gtk2/gnome environment? As expected: None of the two 3945 wlan drivers worked (Mandriva and Ubuntu can do it – why not Opensuse?). Of course suspend does not work either. The rest looks quite ok but the usual showstoppers have convinced me of the following: LoL (Linux on Laptops) is a waste of time as long as it’s not 100 percent confirmed that a certain distro works on a certain model. 3945 has worked well for me since 10.1 at least… maybe your experiencing somewhat of a corner case. You might be able to help the devs squash a nasty bug. You should look into it deeper. What kernal version is being used in this distro? At DW you can see package version list for all releases of SuSE and openSUSE (as you can for other distros). I can see kernel version 2.6.22.5 listed as shipping with 10.3 (current Factory/development version kernel is 2.6.23.1). A 10.3 live DVD (with more software) would be great, as well as a small KDE usb release. Also it should be easier to get the non-oss extra CD (more links, etc). Thank you for openSUSE-10.3-GM-GNOME-Live-i386.iso. md5sums is OK. I have got first KDE, and then GNOME live. But, compared with kde, gnome version don’t have drivers for c-media CMI9761A. There isn’t support for ntfs partitions (Storage media). This is strange for me. Am I right? What is the problem? or is this normal for gnome cd? all steps till ‘Configuring X’ pass fine and then it runs into black screen…..
has someone managed to run it under this video card ? I had the same problem, too. 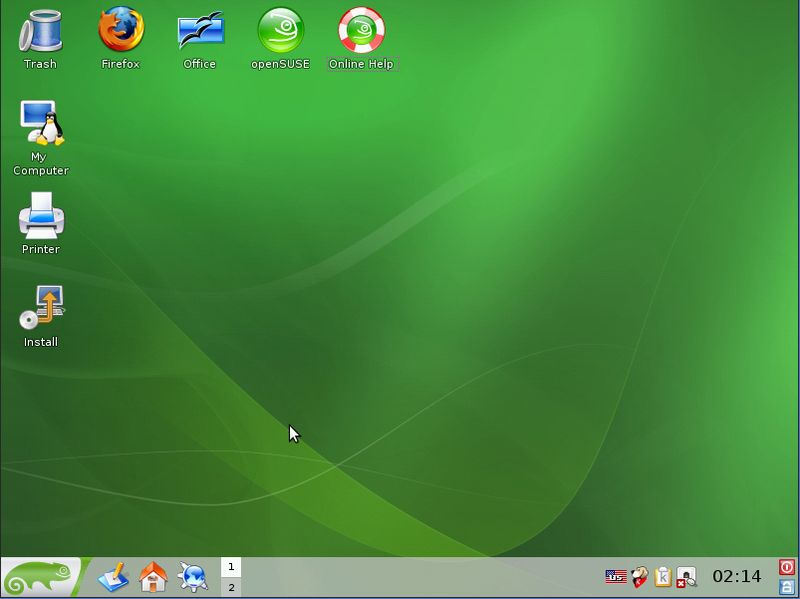 Its a pity, because openSUSE 10.2 was my first distro I started to use after several other distros I just tried before. My HW is Asus barebone Vintage AH1 with ATI Xpress 200. 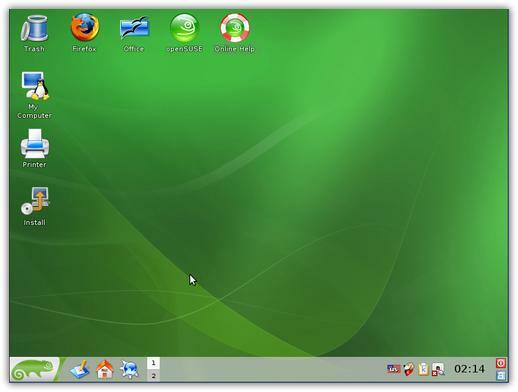 But I have tried Mandriva One KDE for the first time and I liked it very much, Compiz Fuzion worked well even from live CD. doensÂ´t work on my DELL OptiPlex GX620 (just like the full install version 10.3). Problem is my ATI card, an X600. IÂ´m very disappointed :-( All I gets is a blank screen ! Running Ubuntu at this moment (which is not 100% perfect on my system, it freezes my PC randomly (seems to be a bug). If you (or anyone else) are SERIOUS about SUPPORT, I would recommend that you visit the link above and choose a preferred method – Forums, Usenet, IRC – of communication to get it.IMHO,this place is NOT the place to seek support, though feedback is probably OK. Thanks Robert for your advise, it wasnÂ´t my intention to look for support here, I know the right places for that. The only thing I like to say is: if people with an ATI X600 should think that the driver problem would be solved with the Live CD, theyÅ•e wrong. ThatÂ´s what I thought. Hmm, just downloaded KDE version and tried on my ThinkPad R61… Disappointed – my standard USB optical mouse (Microsoft) is dead… I always give a try to new SUSE distro by it looks like the newer version the more problems with common things… like the mouse in this case… Nobody expected TrackPoint to be working but mouse…? Has somebody else similar experience? There are already some working (though unofficial) torrents available. Doesn’t work on Dell 1420n (still stuck in Ubuntu hell). Fails trying to start X server and loading KDM. Used Ctrl-Alt-Backspace and got to command prompt, then ran sax2. Running startkde still didn’t work. Using Intel graphics X3100. Downloaded the Gnome Live 10.3 CD and I must say: very impressive!! I guess everything worked right away, but I know I have linux friendly hardware. And now I also want to have a look at the KDE version as well. cam I boot from USB the openSUSE 10.3 Live? snd how? Install MySlax Creator on a windows comp and download the openSUSE ISO. The MySlax program will walk you through the rest. and if you can follow directions the PDF is always quite up to date. maybe a nice distro but I could not see it. my ati radeon express 1100 had an issue with the radeon driver and i just saw a blank screen. maybe with the openGL driver it can work better, but someone has to publish another kde-live. kill the xserver, then login as root, then “init 3”, then “sax2 -r -m 0=vesa”, then “init 5” and you can see the new openSUSE 10.3 live kde. Not bad actually. – Although monitor is capable of 1280×1024, display turns black. And stays black. Manual setting to 1024×768 during boot solves this, though. But this is not for a casual user. – Will not boot: Kernel exception, cannot mount root file system. Again, this is reproducable on 2 different PCs, both running 10.2 really stable otherwise. At least, the Live CD is totally unusable for me. I downloaded the Gnome live cd. I retired it 3 times, lowering the graphics each time. Finally with a setting of 800×600 and noapic option the live cd loaded successfully. I started with SUSE about a year ago and have tried many distros. I am really looking forward to playing with this. Then you have good luck. Tried to run Live 10.3 Gnome also on my third machine, quite a new DELL Inspiron 6400 notebook. Also: NOGO: Can not mount root file system. Can I save the configuration on a USB Device like Knoppix? PCLOS uses Mandrake’s hard drive partitioner. I have PCLOS 2007 on a machine right next to this opensuse 10.3 box. i agree that Mandriva/PCLOS disk partitioner is good – but having experience with both – opensuse’s is far better. managed to boot into the LiveCD but is unable to see my harddisk in Konqueror. anyway to make openSUSE see my harddisk? what is the best way to remaster this cd to include broadcom support. Got opensuse 10.3 DVD installed with Gnome Desktop. Still lacking compatibility with wireless cards… Nevertheless, good distro to start using linux. 10.3 GNOME Live CD doesn’t fly on my Dell Inspiron 1501 laptop. Almost gets there, then a blank screen with a big (2 cm) square mouse cursor and no further. 10.3 LiVE CD can’t see my NTFS partitions or maybe I can’t find them (I’m newbie in Linux). I also think that it’s a big mistake that there’s no option to remove LIVE CD after unloading and before rebooting computer. I think that openSUSE is the best Linux Distribution avaliable. I recommend that you try. also oproblems with auto updater. Unable to check whether updates are available. It says i need to Add update sources, but they alredy there. :) so guys.. a lot work to do still :) good luck. i’m heading back to my Kubuntu. What about using Live CDs to find out if a program is “compatible” with that version in particular? Is it possible to install packages and LInux based programs running on the Live CD to achieve this? > Is it possible to install packages and LInux based programs running on the Live CD to achieve this? Thank you very much Beineri. One more question: how is the workflow to uninstall the LiveCD version in order to install the “real” version? ..and so on. This is what I found at SUSE’s site. Do you know where to find a clearer explanation? > One more question: how is the workflow to uninstall the LiveCD version in order to install the â€œrealâ€ version? You don’t need to reinstall from DVD, you can install compared to DVD isntall ‘missing’ packages/pattern via software management. Did someone download openSUSE 11.0? Do you have any pdfs -grally the referene, starup, apparmor manuals- at /docu? ’cause I don’t. Downloaded and burnt the KDE version of 11.3 live CD. Laptop IBM T-20. Pity that the KDE desktop crashed at startup. Not a good start, to say the least.